Somehow I need to get in touch with the Michigan coaches or players. (Denard Robinson would be great). But here is what I am trying to do. I am planning a wedding. 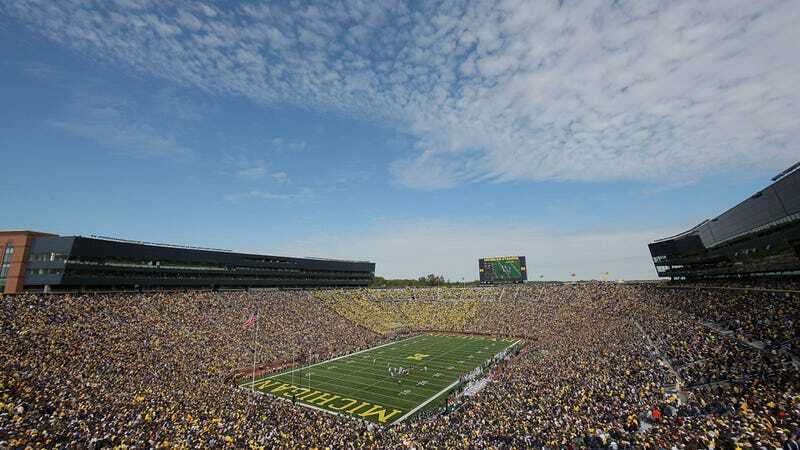 The man I am going to marry is a huge Michigan fan and season ticket holder, and without him knowing, I would love to look into going to the stadium and maybe saying our vows on the 50-yard line. Or having a "guest" come to our wedding. Anything. Do you think you could help me get in touch with someone to help make a dream come true? We all have dreams, and mine would be to have a MICHIGAN WEDDING. So: how might we go about helping this lady? If you have any ideas—or might be able to help her yourself—email us. UPDATE, 3:35 p.m.: Many helpful readers have passed along Michigan's special events rental site. We are passing it along in turn. And, hey, if you know Denard Robinson, or something, you are still encouraged to drop us a line.